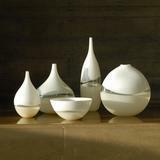 Modern hand blown glass vase • Chroma low triangle by Siemon & Salazar Each piece is handmade to order. The glacier series is an exploration of glass and color in pure forms inspired by frozen ice flows and crisp clear light. Thick glass and overlapping transparent colors are used to create pieces that will color shift depending on one’s vantage point. Made to order item. No molds are used, and each shape is unique. Hand blown and shaped in lead free crystal. Designed and made by Siemon & Salazar in California. Signed. Measures: 8.5” T x 7.5” W Product number: 52-103-229.